Introducing Q-104 Water Soluble Topping » Embroidery Talk Has Moved! Those who follow EnMart on Facebook or who attended the NNEP Embroidery Mart in Nashville may already know about Q-104. For those of you who don’t, I thought it was time to do a blog post and let you all know about this revolutionary new topping and the great effects it can help you create. First, let’s start with what Q-104 is and what it does. Q-104 is a water-soluble felt topping for machine embroidery, perfect for creating vintage-styled, loose three-dimensional designs. Using Q-104 is simple, with most designs that feature fairly wide satin-stitch elements requiring very little alteration to achieve a three-dimensional effect. Your imagination is the limit as to the textures you can create. This topping dissolves easily in water leaving behind only the embroidery. If you’re familiar with puffy foam, Q-104 can help create a 3-d effect, but is not exactly the same sort of thing. Designs do not need to be digitized specifically for Q-104, nor does the excess topping need to be torn away once the embroidery is done. Q-104 is water soluble, so submersing your finished embroidery in water and agitating it will cause the topping to melt. For best results, running the embroidery through a cycle in your washing machine is recommended. Creating a design for use with the Q-104 water soluble topping is relatively simple. 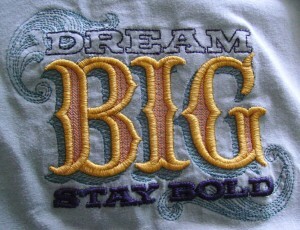 First, designate which portion of your design will be three-dimensional and execute it in a fairly wide satin stitch. It’s easiest to always plan for the Q-104 to run last. If you have multiple 3-d elements in different colors, you can use the same piece of Q-104 for all 3-d color changes. Because Q-104 washes away completely, you don’t have to worry about colored support material. Just remember to stitch your two-dimensional elements first. Q-104 can be used to create a wide variety of designs and effects. Depending on the length and tightness of your stitches, you can create small puffed letters, or larger designs with a looser 3-d effect. The only limit on what you can do with Q-104 is your imagination. To request a sample, contact us and we’ll be happy to send you one. If you do create something awesome with Q-104, send us a picture, we’d love to see what you’ve made. This entry was posted on Tuesday, September 18th, 2012 at 9:54 am and is filed under Backing/Stabilizers. You can follow any responses to this entry through the RSS 2.0 feed. Both comments and pings are currently closed. If the Q-104 is water soluble, will the 3D effect eventually wash away on garments that are washed frequently? I know the 3-D effect does not fade, because I’ve seen a number of samples that have been embroidered for a while, but I’m not sure exactly why that is. Let me talk to my experts and I’ll get you a better answer on this.